Yep, I’m still a kid on Christmas. I had something else planned for today but obviously I needed to rearrange my schedule when I saw two of my favorite ladies, Helene and Taylor, whip up this little gem. I probably should be embarrassed about the things I’m about to admit but hey, when it comes to Christmas, I have no shame. As I near the 27th year of my life, I’ve stuck to my guns on one rule, every single year. NO PRESENTS WILL BE PUT OUT UNTIL I AM ASLEEP. Yes, maybe this ridiculous request was due to end when I discovered Santa was not a jolly old fella who came down the chimney and flew on a sleigh, but I refuse to let my parents do this until I’m in bed. Still. Despite the fact that last year I was sleeping in bed with my husband and new baby, it still wasn’t allowed. We took turns opening presents; my brother would go, then I would go. It made things last longer and I always loved seeing what he got from Santa and vice versa. This applies today too… sorry mom and dad. Cookies and milk will always be put out. Always. I have an excuse now because I have a child but regardless, the man needs to eat. I start listening to Christmas music the week of Thanksgiving and always will. Sure, they play the same songs over and over again and just switch up the artist who sings them but I love them none the less. Nothing says Christmas like driving around looking at lights and jamming out to my favorite holiday tunes. 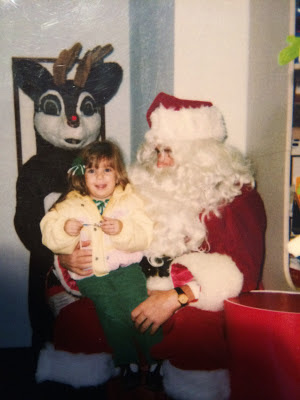 Seeing Santa is a must. 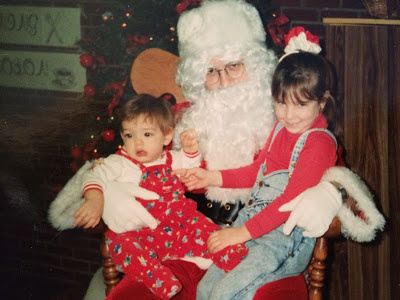 Yes, I have a kid now and it’s totally acceptable but regardless of age, I think everyone needs to see Santa. We don’t have to sit on his lap anymore (which is still a bizarre concept to me but that’s a post of a different color) but seeing the man and his elves and the joy in the kiddos’ eyes is always going to bring happiness to my little Christmas loving body. And when my kids get too old, I’ll just walk by and smile and whisper my Christmas wishes in hopes he has magnificent hearing and just hears it from afar. Remember all of those ridiculous outfits our parents dressed us in? Bows bigger than our heads, plaid jumpers, furry dresses, etc? Yep, I’m bringing it back. Because nothing says “photo opp” like little kids in Christmas getup. And you bet your bottom dollar I will always collect ugly Christmas sweaters; it’s become a tradition to find an uglier one each year and it’s SO exciting to rock kittens, penguins, or other little creatures while celebrating the birth of baby Jesus. And there you have it. I’m sorry I’m not sorry I’m still a big kid and having kids myself now excuses some of my antics. 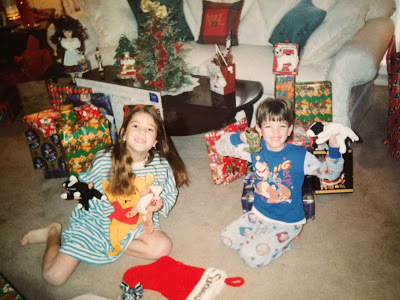 But no matter what, Christmas will always hold the magic it held when I was little. 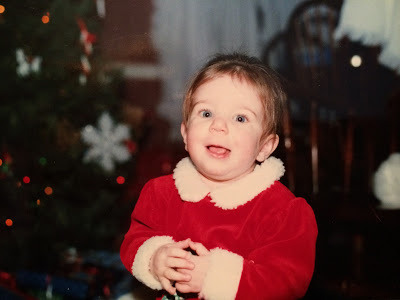 I know there’s been some controversy about people straying from the real reason for the season and incorporating elves, Santa, etc but from what I can remember, Christmas was the greatest part of my childhood. The excitement of going to bed and awaking to a pile of gifts under the tree. Going to church with all of my cousins and getting together afterwards. Our traditional Italian meal of pizza, pasta, sausage, etc on Christmas Eve. Watching A Christmas Story for hours on end. Calling my friends to tell each other what Santa brought us. Setting up new toys and being more excited than ever before. And I want my kids to have the same feelings as well. Yes, Jesus is the reason for the season but the magic of the other things doesn’t take away from that. And I plan to give my kids the same magical childhood my parents gave me. Now go link up kids! 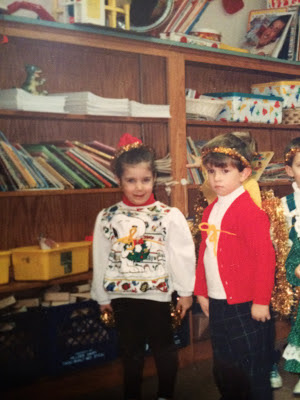 Hope you have more fun than this little boy next to me in the picture below… #grinch.